If you are an author or publisher with a forthcoming book, let us know to be included on future round-ups. Just email tips@critical-theory.com. Louis Althusser’s renowned short text ‘Ideology and Ideological State Apparatuses’ radically transformed the concept of the subject, the understanding of the state and even the very frameworks of cultural, political and literary theory. The text has influenced thinkers such as Judith Butler, Ernesto Laclau and Slavoj Žižek. The piece is, in fact, an extract from a much longer book, On the Reproduction of Capitalism, until now unavailable in English. Its publication makes possible a reappraisal of seminal Althusserian texts already available in English, their place in Althusser’s oeuvre and the relevance of his ideas for contemporary theory. 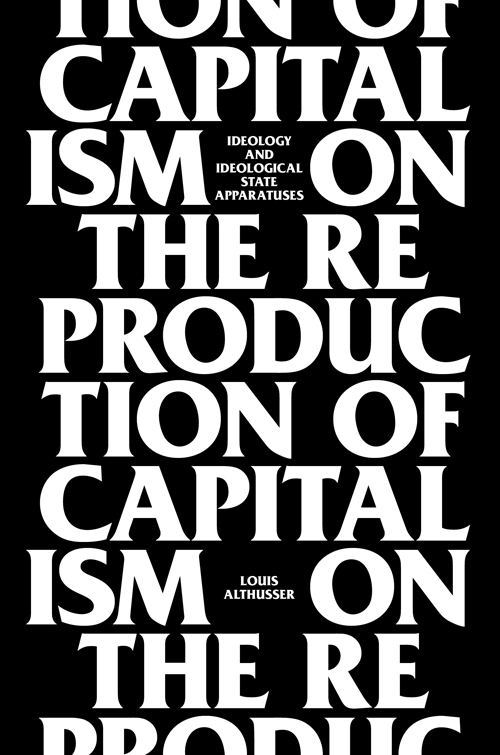 On the Reproduction of Capitalism develops Althusser’s conception of historical materialism, outlining the conditions of reproduction in capitalist society and the revolutionary struggle for its overthrow. Factory of Strategy is the last of Antonio Negri’s major political works to be translated into English. 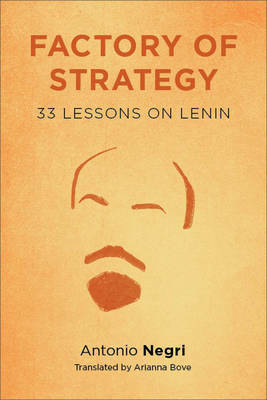 Rigorous and accessible, it is both a systematic inquiry into the development of Lenin’s thought and an encapsulation of a critical shift in Negri’s theoretical trajectory. Lenin is the only prominent politician of the modern era to seriously question the “withering away” and “extinction” of the state, and like Marx, he recognized the link between capitalism and modern sovereignty and the need to destroy capitalism and reconfigure the state. Negri refrains from portraying Lenin as a ferocious dictator enforcing the proletariat’s reappropriation of wealth, nor does he depict him as a mere military tool of a vanguard opposed to the Ancien Régime. Negri instead champions Leninism’s ability to adapt to different working-class configurations in Russia, China, Latin America, and elsewhere. He argues that Lenin developed a new political figuration in and beyond modernity and an effective organization capable of absorbing different historical conditions. He ultimately urges readers to recognize the universal application of Leninism today and its potential to institutionally—not anarchically—dismantle centralized power. 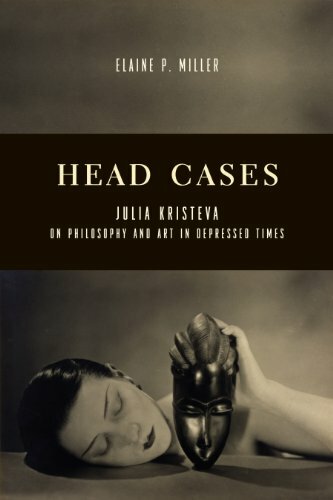 Reviewing Kristeva’s corpus, Elaine P. Miller considers the intellectual’s “aesthetic idea” and “thought specular” in their capacity to reshape depressive thought on both the individual and cultural level. She revisits Kristeva’s reading of Walter Benjamin with reference to melancholic art and the imagination’s allegorical structure; her analysis of Byzantine iconoclasm in relation to Freud’s psychoanalytic theory of negation and Hegel’s dialectical negativity; her understanding of Proust as an exemplary practitioner of sublimation; her rereading of Kant and Arendt in terms of art as an intentional lingering with foreignness; and her argument that forgiveness is both a philosophical and psychoanalytic method of transcending a “stuck” existence. Focusing on specific artworks that illustrate Kristeva’s ideas, from ancient Greek tragedy to early photography, contemporary installation art, and film, Miller positions creative acts as a form of “spiritual inoculation” against the violence of our society and its discouragement of thought and reflection. The theoretical writings of Jacques Lacan, Gilles Deleuze and Alain Badiou stand at the heart of contemporary European thought. While the combined corpus of these three figures contains a significant number of references to each other’s work, such references are often simply critical, obscure – or both. 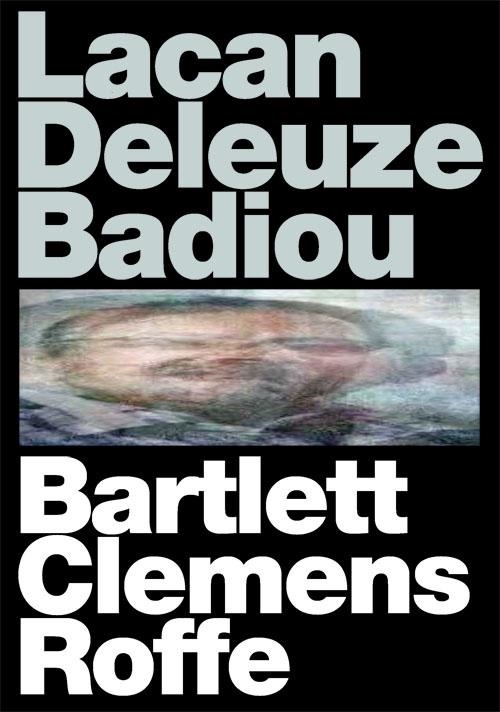 Lacan Deleuze Badiou guides us through these crucial, under-remarked interrelations, identifying the conceptual passages, connections and disjunctions that underlie the often superficial statements of critique, indifference or agreement. Working through the rubrics of the contemporary, time, the event and truth, Bartlett, Clemens and Roffe present a new, lucid account of where these three thinkers stand in relation to one another and why their nexus remains unsurpassed as a point of reference for contemporary thought itself. The 11 essays in this volume, including a new piece by Badiou himself, reflect the formative traditions that shape the background of his political thought. 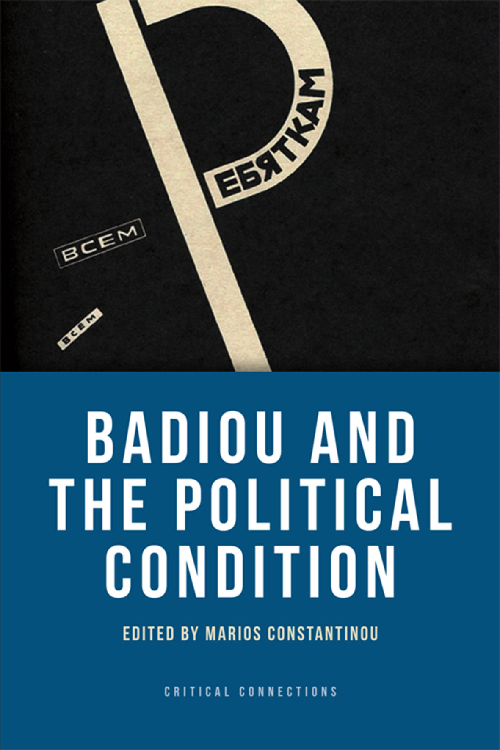 They intervene critically and evaluate the present state of Badiou’s work, while also breaking new ground and creating new thresholds of political thought. The contributors are a range of established scholars and rising theorists of the Badiou-effect. Each engages with the critical question of ‘how to transmit the exception’ politically. at the intersection of contemporary anti-imperial polemics and debates that strike at the heart of the post-modern condition (Lyotard), deconstruction (Derrida), psychoanalysis (Lacan – Zizek), biopolitics (Hardt and Negri) and pedagogy (Rancière). Slavoj Žižek is the most popular and discussed philosopher in the world today. His prolific writings – across philosophy, psychoanalysis, political and social theory, film, music and religion – always engage and provoke. The power of his ideas, the breadth of his references, his capacity for playfulness and confrontation, his willingness to change his mind and his refusal fundamentally to alter his argument – all have worked to build an extraordinary international readership as well as to elicit much critical reaction. 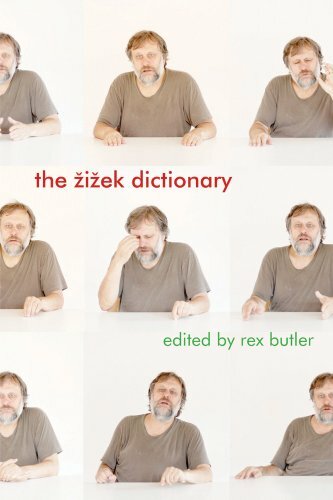 The Žižek Dictionary brings together leading Žižek commentators from across the world to present a companion and guide to Žižekian thought. Each of the 60 short essays examines a key term and, crucially, explores its development across Žižek’s work and how it fits in with other concepts and concerns. 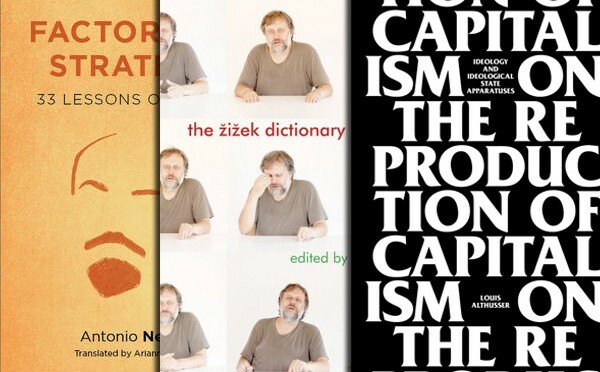 The dictionary will prove invaluable both to readers coming to Žižek for the first time and to those already embarked on the Žižekian journey. In the antebellum South, plantation physicians used a new medical device—the spirometer—to show that lung volume and therefore vital capacity were supposedly less in black slaves than in white citizens. At the end of the Civil War, a large study of racial difference employing the spirometer appeared to confirm the finding, which was then applied to argue that slaves were unfit for freedom. What is astonishing is that this example of racial thinking is anything but a historical relic. 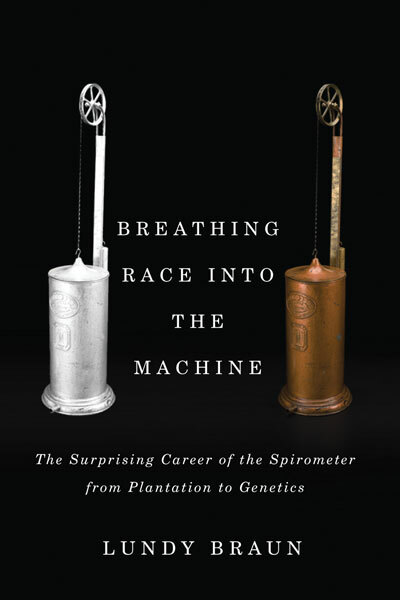 In Breathing Race into the Machine, science studies scholar Lundy Braun traces the little-known history of the spirometer to reveal the social and scientific processes by which medical instruments have worked to naturalize racial and ethnic differences, from Victorian Britain to today. Routinely a factor in in clinical diagnoses, preemployment physicals, and disability estimates, spirometers are often “race corrected,” typically reducing normal values for African Americans by 15 percent. An unsettling account of the pernicious effects of racial thinking that divides people along genetic lines, Breathing Race into the Machine helps us understand how race enters into science and shapes medical research and practice. Narrating an intellectual history running from the eighteenth through to the twentieth centuries, Losurdo examines the thought of preeminent liberal writers such as Locke, Burke, Tocqueville, Constant, Bentham, and Sieyès, revealing the inner contradictions of an intellectual position that has exercised a formative influence on today’s politics. 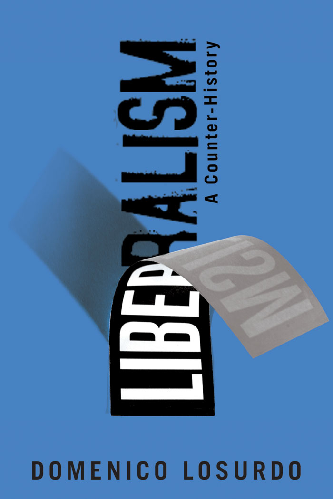 Among the dominant strains of liberalism, he discerns the counter-currents of more radical positions, lost in the constitution of the modern world order. The advent of the cinema radically altered our understanding of time, space, and reality. With his experience as a pioneering avant-garde filmmaker, Jean Epstein uses the universes created by the cinematograph to deconstruct our understanding of how time and space, reality and unreality, continuity and discontinuity, determinism and randomness function both inside and outside of the cinema. Time, he says, should be regarded as the first, and not the fourth, dimension — and the cinematograph allows us, for the first time, to manipulate it in directions and speeds of our choosing. The theoretical work of Jean Epstein greatly influenced later generations of cinema philosophers, notably Gilles Deleuze and Jacques Rancière, but the bulk of his work remains unpublished. 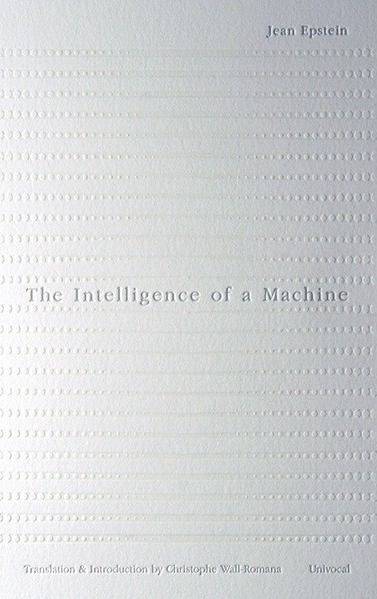 The Intelligence of a Machine, his first major title published in English, is one of the earliest philosophies of cinema.